On Friday evening at the MedAsia Playa in Sliema, Malta, local promoter Darren Casha pulled all the stops out to present one of the most exciting nights of Boxing and Music to herald the end of the summer season on the Islands. I’ve been to some sensational events over the years, but have never attended anything like this before. Firstly the location, which was right on the shores of the Mediterranean, and seriously I mean right on the shore, as the ring was set up across one of the swimming pools at the stunning MedAsia Playa, literally just a couple of meters at most from the shimmering Mediterranean Sea. The music, well what can I say, no less than Dance Chart toppers Phats and Small performed throughout the event and when not actually performing vocalist Ben Ofoedu MCd the Boxing element. Talking of which let’s get down to the boxing, well the start of the boxing element at least, as prior to the actual fights a minutes silence as well as a Ten Bell Salute were made for the legendary Jake LaMotta, who passed away just a few days before as well as for former Polish American Boxer and Kronk Coach Peter Pozyczka who passed away exactly 12 months to the day. Peter’s daughter Victoria, who had travelled from California to Malta for the anniversary of his death, was is attendance as a special guest and was invited into the ring to talk about her father, who had fought in Malta back in the 1990s and was so taken with the people and the beautiful Islands that Victoria felt Malta would be the perfect place to scatter his ashes on the anniversary of his passing. OK, now onto the Boxing. 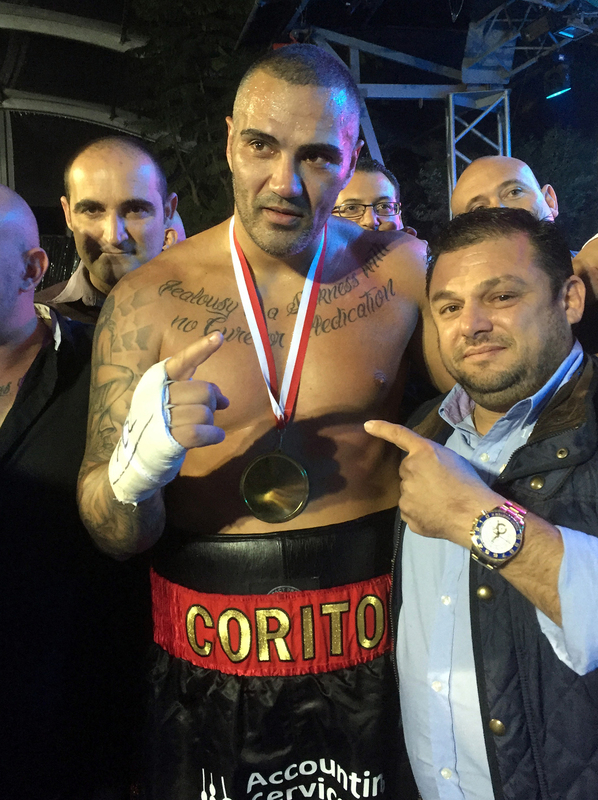 The headline bout was a pro Heavyweight contest between Malta’s own Billy ‘The Hitman’ Corito and Ukrainian Igor ‘The Beast’ Pylypenko. Pylypenko received a genuinely warm welcome from the eight hundred or so revellers in attendance, but when Ben Ofoedu announced the imminent arrival of local hero Corito the decibel level went off the dial. Round one see both protagonists go straight on the attack, Pylypenko throwing out big straight jabs in an effort to stop the hard charging Corito landing any of his trademarked big swooping shots. As the round progressed the big Ukrainian used his height and reach advantage to good effect, stepping in and letting rip with big right and left combinations before stepping back before Corito could land anything significant. However that didn’t deter the Hitman, he just walked his way through, taking the odd shot here and there, before getting his shots off on the inside. Cracking all action round. More of the same in the second, although at times the fight turned into a hybrid form of boxing/MMA with the big Ukrainian tying up Corito each time he came on the inside, and on the odd occasion literally hooking his leg round Corito’s as well as rather suspect use of his head. So it came as no surprise that Corito sustained a rather nasty cut above his right eye. The third round wasn’t much different, except Corito stepped up a gear and was able to find the room and land some sensational shots, one of which sent Pylypenko to the canvas. It was a very bad round for the Ukrainian, points wise, as referee also deducted a point after catching Pylypenko again using his head when in close combat. The fourth was again a full on war and unfortunately quite early on there was another clash of heads, not sure if deliberate or not by the Ukrainian, but the after affect being a serious cut over the left eye of the Maltese Champ. With blood covering his face Corito had the appearance of a Gladiator in full battle at the Colosseum, and the way he fought he would have fitted right in, clearly realizing there was a chance the bout would be stopped Corito went to war throwing huge shots, whilst many landed solidly, the big Ukrainian soon reverted to tying his opponent up and backing him onto the ropes in a relatively vain attempt to prevent further big shots landing. About midway through the round, referee Charlie Cardona called time out and had Corito’s corner wipe some of the blood from his face. The fight resumed with Corito very much on the ascendance but a minute or so later there was another close quarters clash of heads. This time the referee called time out and signalled for the ringside Doctor to inspect the cuts, following the inspection the Doctor signalled that the cuts were way too serious for the contest to continue and Referee Charlie Cardona waved the contest off on the two minutes and forty-nine seconds mark of the fourth round and declared the contest a ‘Technical Draw”. Prior to the headline Corito-Pylypenko contest were three exhibition bouts, the first being a Malta Vs UK contest between local lass Marie Claire Church and Sophie Gelder from Sheffield, which was followed by an all Maltese contest between Team Corito’s Way boxers Redent Galea and Paul Zammit and the final exhibition bout see Malta based Former World Champion Scott Dixon against Bradford’s Chucky Robson, who had taken time of from his honeymoon to take part. As I said at the beginning this was one serious special event and the location was, well what can I say, just phenomenal. I just hope that Darren Casha does another just like this next year, if he does I’m booking my flights right away.